the pink clutch ...: Murphy ... the dog of many talents! 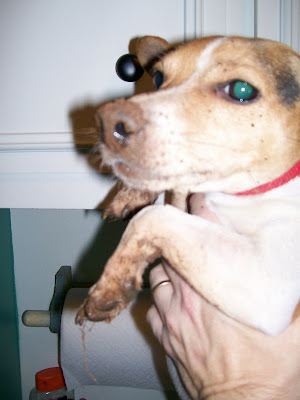 This is Murphy (right after digging his way out of the yard) ... he is a Jack Russel Terrier and probably the worst dog ever. He is naughty, way too smart, an escape artist and most commonly a pain in my arse!!! Why is he still around? Babycakes! This baby girl LOVES her dog. Since she could crawl she has always loved that dog. He drives me crazy ... she adores him. He digs out of the yard on a weekly basis and will not come to my call ... at.all. She goes out and calls his name ... he comes running! I swear at times he looks and smells like he is wearing Princess chapstick. It started with the names ... first it was just "My Murphy", then he was "My Pink Poodle" and now he has moved onto her "Chick-a-wa-wa" (she picked it up from The Chipmunks). She has bought him things (well, really me) and insists on taking him everywhere in the car (and I refuse). She is responsible for feeding both dogs. She gives Miles (the other Jack Russel) a 1/2 cup of food and Murphy about a cup and a half. Every time she walks by and his bowl is empty, she gives him more. We are lucky he only weighs 10 lbs. and not 110 lbs. She spends hours of day playing with him, walking him on a leash in the back yard and teaching him things. She started coloring in the laundry room next to him and then she upgraded to trying to better him. She reads to him (makes up stories and shows him the photos in the book) and teaches him tricks and he could literally care less! But she insists he loves it. So today is probably my personal favorite ... she is teaching him to talk. Yes, you heard me. This morning she locked him into the laundry room with her for his lessons. She was sitting on a stool talking for ever. She came out for pen and paper and Daddy had some questions. Lawyer: What are you doing in there? Babycakes: Teaching Murphy to talk. Lawyer: Oh yeah, how is that working out for you? And she proceeded to head back in the laundry room! Once he can talk who knows what she will want to teach him. If it was up to me his days would be numbered ... she will having him running for president in 2012! oh, sounds llike murphy is a lot of fun! such a naughty little dog, always on the hunt! Maybe Murphy wanted to come rescue Lucy. Oh that is the cutest story!! Murphy must have a ton of energy. My parents next door neighbor have a Jack Russell and he gets out once a week. He digs a hole and tunnels under their fence and my mom's dogs just sit there and stare! You will have to read "Martha Speaks" to her. It's about a dog who can talk. Very cute. I love a Jack Russell - I have been told by many many many people to on by and stick to my labs. One friend's Jack Russell chewed the entire front door molding in one afternoon. All she had left was a brass lockset and splinters. It was not a very pretty afternoon in that house. this is too cute...and I can relate to it too well! Sounds like Babycakes and Baby Girl are two in the same. Hey you never know...I saw a pug on Letterman who could say I love you!